up against him. The poem is both distinctive and amusing and a nice inversion of the Western status quo. He lives as parsimoniously in heaven as he did on earth except for the unanswered phone that rings constantly and the reason for this makes for a sad a thoughtful dénouement to the poem. “I like to think that she did. feel unnecessarily instructive and prevent the reader from drawing their own conclusions, which is surely one of the attractions of poetry? Lowe is not what I would call a lyrical poet. His voice is laconic and American and the style of these poems is dryly conversational. 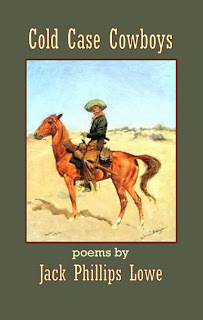 This fits the urban cowboy theme of the poems very snugly. From time to time though, I did wonder if he or I had wandered from poetry into prose. That’s not necessarily a bad thing: there’s an active prose-poetry movement on the up these days, but is worth noting if you like your poetry more ostensibly poetic. If, however, you like your poetry narrative and reflective of contemporary man-in-the-US-street existence, you might want to check out Cold Case Cowboys. Cold Case Cowboys by Jack Phillips Lowe is published by Middle Island Press and is available from www.middleislandpress.com and www.Amazon.com.